Next on The Scoop: What Is the Average Lifespan of a Cat? If you’re anything like me, you probably have dozens of toys for your cat, 90 percent of which she never touches. But that 10 percent of toys she does touch — they certainly get quite a lot of use, which equals a lot of grime and cat spit. So how exactly do you clean your cat’s toys? It is a better idea to hang cat toys to dry. Photography ©DmitriyKazitsyn | Getty Images. Avoid scented detergents and fabric softeners as these can be off-putting to cats. I hang the toys to dry rather than putting them in the dryer. 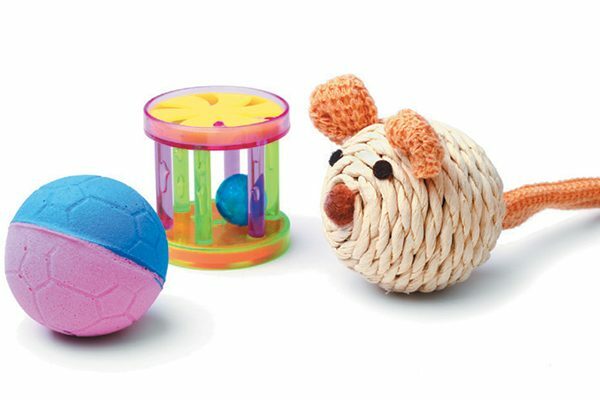 Machine drying could cause the toys to shrink or warp, or rope toys could come apart. Wash plastic toys by hand with dish detergent and hot water to kill any germs. Clean off any stuck-on residue with a sponge or dishcloth, not a scrubber. Scrubbers create tiny scratches that can harbor bacteria, which decreases the life of the toy and could make your cat sick. Most plastic toys and puzzle feeders are not made to be washed in the dishwasher. Check with the manufacturer to see if the product is dishwasher safe, but most soft plastics will warp in the heat of the dishwasher. Lightweight toys could get thrown around inside the dishwasher and possibly break not just the toy but the dishwasher as well. Fur toys need to be hand washed. Photography ©Gina Cioli. Toys made of fur — whether real or artificial — are too fragile for the washing machine. Handwash in hot, soapy water, rinse thoroughly and hang to dry. Rinse the feather part in hot water and leave the toy to hang dry — out of your cat’s reach, of course. Most catnip toys are made of fabric. Since your cat does a lot of chewing and sucking on them, you don’t want to run the risk that the catnip will be contaminated with detergent or fabric softener. For these, I recommend a hand rinse and a good wringing out, then hang them to dry. Do not dry catnip toys in the dryer; doing so will cause the catnip to lose its potency. If your catnip toy is the kind that you can refill with fresh catnip, simply remove the old stuff, rinse the toy in hot water, and, once dry, put in some new herb and watch your cat go to town! When stuffing starts falling out it’s time to throw the toy away. Photography ©StockImages_AT | Getty Images. Cats have certain toys that are their favorites. They carry them everywhere, play with them every day and sometimes even sleep with them. This means the favorite toys wear out faster. I’ve been known to sew up the holes in old favorite toys and let my cats use them until there’s no stuffing left. But I know that’s a little bit over-the-top, so here are signs it’s time to say goodbye to your cat’s most-loved toys. Fabric toys and catnip toys: When the toy begins to rip and the stuffing starts falling out, throw it away. Otherwise, your cat may swallow some of the stuffing, which could result in an intestinal blockage and a costly emergency vet visit. 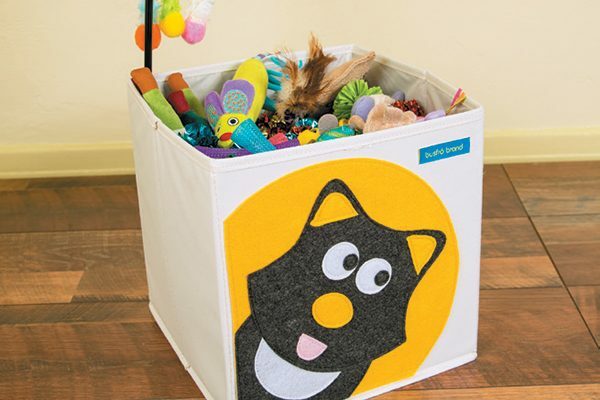 If your cat pees on the toy or it ends up in the litter box next to something gross, toss it. No amount of washing will make that smell go away. Plastic toys: If you see scratches in your cat’s plastic toys, toss them because of that problem of bacteria buildup. Likewise, if the toy breaks or if small parts of it are starting to come off, get rid of it before those parts end up in your cat’s stomach. Fur or feather toys: Once the feather breaks or starts falling apart, retire that toy and replace it. 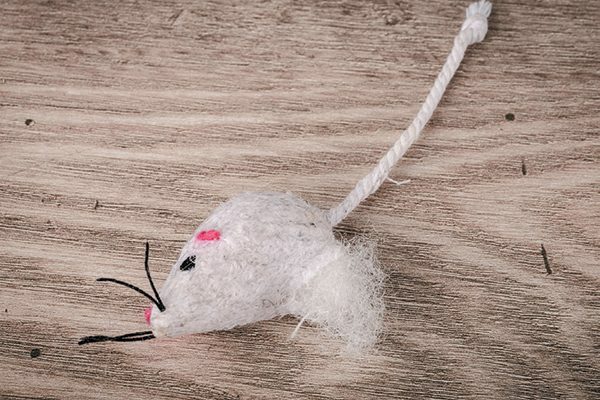 Fur toys should be thrown out if they get urine or other bodily wastes on them, or when they get so ripped up that the cat is in danger of swallowing them. 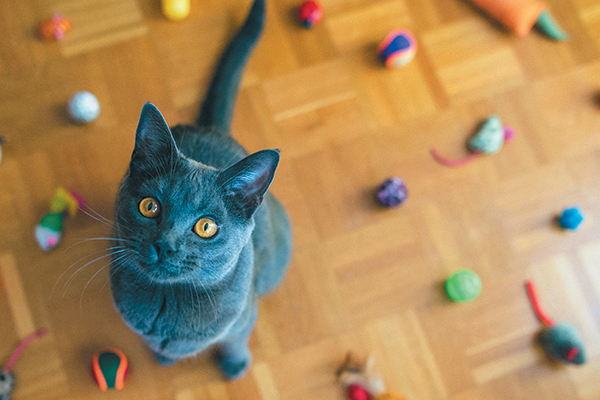 These cleaning tricks will give your cat’s old toys some new life. We’d love to hear any other cleaning tips from you! Just email catstermag@belvoir.com. Thumbnail: Photography ©cunfek | Getty Images. JaneA Kelley is the author of the award-winning cat advice blog Paws and Effect and a contributing writer at Catster.com. She is a volunteer with Diabetic Cats in Need, a nonprofit that helped save her diabetic cat’s life.